Barrett's Boston Banter: Miracles! Miracles Everywhere! Gosh, this week has been amazing! So many amazing things happened! So on Tuesday we went to see one of our investigators, Gilka. Guess where she's from??? Yes that's right..Brazil! Well, when we went there her son, Tarcio was there and he had A TON of questions for us! Great questions! When we bore our testimonies to him about how the gospel of Jesus Christ can change his life he straight up told us that he really wants to make changes in his life. He said he wants to serve others, go to church etc. He has come to the right people! We took that opportunity to teach him and testify to him about Jesus Christ. He loved it and we're meeting with him again! He's our new investigator! Speaking of family history...after doing that family history stuff for Rayana I became more excited about it and I've been doing some of my own! Wow, it's exciting! I absolutely LOVE it! I feel closer and closer to my family who have gone before me as I find out more and more about them. Sister Saito and I with Emily! She is such a sweetheart! This week we also found a new digital investigator (also from Brazil)! This woman is incredible! Her name is Michelle. 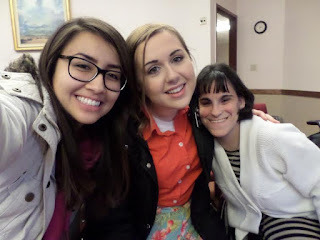 We met her on Tuesday and we talked to her about who we are and what our purpose is as missionaries. We also bore our testimonies to her about Jesus Christ and His Atonement. She loved it! She told us that she wants to read the Book of Mormon so we got her address, called the local missionaries and got them to go by and give her a Book of Mormon and start teaching her. Well, they did! They taught her the Restoration. So when we had another Skype lesson with her on Friday we followed up with that, read 2 Nephi 31 with her and then we invited her to be baptized! Well...she said 'not yet.' But that's not "no". We're Skyping her again tomorrow. We invited her to go to her local church on Sunday. She lives right around the corner from the church. Also, she had another lesson with the local missionaries on Saturday so we'll find out how that went! Gosh, all of this happened in a week! I'm telling you, this woman is so prepared! On Saturday we had a really special experience. So our Zone Leaders told us that they've been in contact with a lot of people from Greenfield lately because Keith, our recent convert is in the hospital in Worcester, where they're serving. They visit him a lot and they told us that we can visit him too because he's our recent convert! So on Saturday we took that opportunity and we went to Worcester to see Keith! He just had heart surgery, but he's doing really well! So we went in and Keith saw us and he said "Ahh hello little Sisters!!" He talked to us as though we never left. But he's SO different now! He has progressed SO much! He talked to us about how the Worcester Elders have been teaching him about the priesthood. They've been preparing him so that when he's better her can be ordained. He's really excited about it. He told us he can't wait to go back to Greenfield, wear his suit and bless and pass the sacrament! Bless his soul! He also talked about how he knows that the trial with his health is helping him to become stronger. He said that God is really helping him through this. Also, while we were there, the Caputos showed up! It was a Greenfield party in the hospital! Before we left, Keith said a prayer thanking Heavenly Father for sending us to him. When we left we were just glowing with happiness. Keith is doing so great and it was incredible to be there with him. KEITH! This is the best picture we could get. It was an awkward angle. I love this gospel so much! It brings me so much happiness! I love being a missionary! It is the greatest blessing!